Kseniya Yarosh (Creator) is a writer, illustrator, researcher, and Brooklyn Zine Fest co-organizer whose zines have been featured in The New York Times, Flavorwire, and Syndicated Zine Reviews. She is a co-host of the film podcast Bonnie & Maude, which examines movies from a female perspective. She has produced femme-centric video variety shows in Brooklyn, including You Are Hair and Watching You Eat. 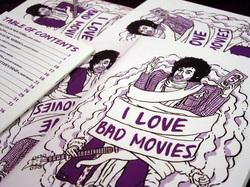 Kseniya is currently working on a zine about the Russian band Браво (Bravo) and the ‘80s rock scene in the Soviet Union. Matt Carman is the editor of Come on Down: True Game Show Tales, an organizer of the Brooklyn Zine Fest, and author of Taken for a Ride: My Night in the Cash Cab. He produces and hosts movie screenings and variety shows with his co-editor, including Flop Night at Alamo Drafthouse. His writing has also appeared in Blood Video, Physical Impossibility: Popcorn Droppers, and the RoboCop (1987) fanzine Thank You For Your Cooperation. He has appeared on podcasts Read it and Weep and Bonnie & Maude, and NPR’s Ask Me Another. 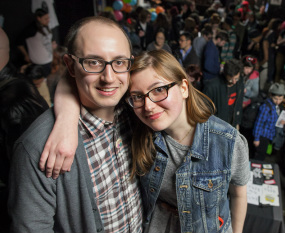 Matt and Kseniya are also the organizers of the Brooklyn Zine Fest, and look forward to organizing many more NYC events. All contributors are listed by the latest issue in which they appeared. For repeat contributors, past issues are also mentioned. Claudia Eve Beauchesne is a Montreal- and New York-based writer, curator, and film buyer. She has curated exhibitions of contemporary art and design in Brooklyn, Montreal, and Miami, and is currently writing a book on the history of New York's East Village art scene of the 1980s. 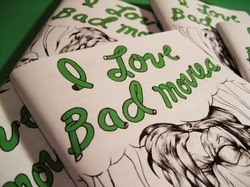 Her writing has also appeared in Tunica, Packet, NY Arts, and Come on Down. 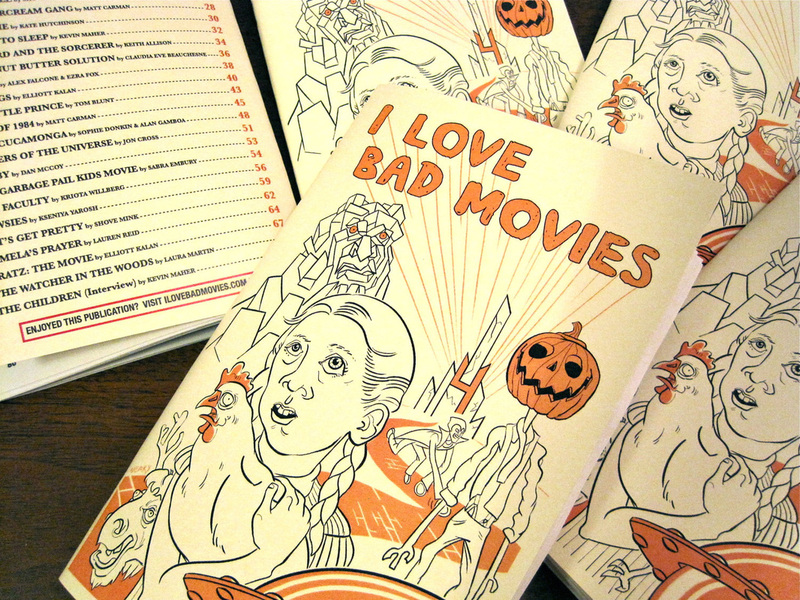 including “Special Guest Picks” by several I Love Bad Movies writers. Cristina Cacioppo is the Creative Manager at Alamo Drafthouse in New York. the initial inspiration for this zine. and owner of Avenue Design Studios. John once recommended Lost Boys: The Thirst to Tom Savini. His writing has also appeared in Come on Down: True Game Show Tales. culture. He is a producer of the VHS collector documentary Adjust Your Tracking. classic horror films on VHS. Tapes’ “Yes I Know,” nominated for a Grammy for Best Short Form Music Video. basically melted his brain. He likes sandwiches. 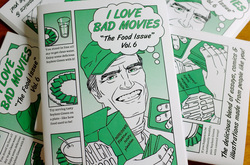 Erin Gallagher (Soylent Green cover) is a freelance illustrator and designer in Brooklyn. 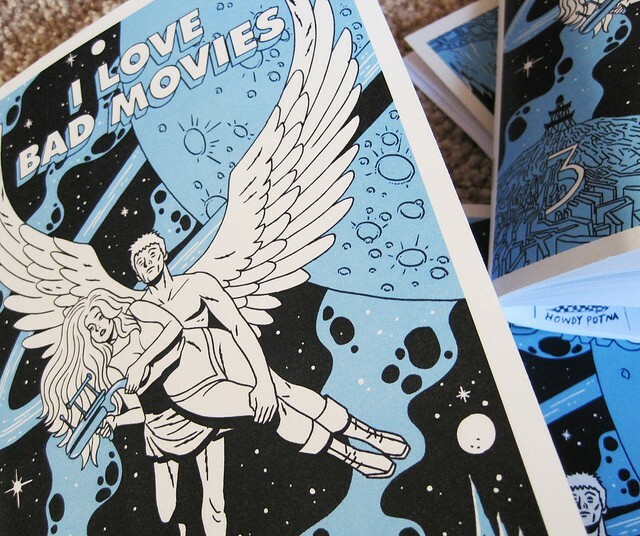 Her illustrations can be seen on storefronts, apparel, and in her own comics and film-inspired prints. Her work has been exhibited in Brooklyn, Los Angeles, and the U.K.
Malaka Gharib (The Stuff illustrated recipe) is the creator and editor of Washington, D.C.-based food zine The Runcible Spoon, which has been featured in The New York Times and Saveur Magazine. She has co-hosted community cookbook-making events in Brooklyn and D.C.
and is a regular contributor to Ultra Violent Magazine. James Jajac (Sledgehammer illustration) is a Queens-born illustrator currently hiding out in Long Beach, NY. 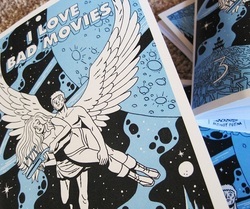 He draws the satirical/nostalgic comic strip The Silver Lining under the alias Tim Warner. His Katy Perry portrait was seen in her documentary Part of Me. and has produced digital radio channels for iHeartRadio. hide up to five bees secretly in her mouth. Out at Alamo Drafthouse and the creator of webseries Andrew 12-Sided Dice Clay. Laura Jayne Martin is a writer whose work has been featured in The Village Voice, The Hairpin, and McSweeney’s Internet Tendency. She wrote the 2008 short film Chemistry and the book Death By Nostalgia, and contributed to Fakes. Dan McCoy is an Emmy-winning writer for The Daily Show with Jon Stewart. animator/co-star of the award-winning short series 9am Meeting. Greg Rebis (Bad sandwich illustrations) is a Providence-based artist working in printmaking, graphic novel illustrations, and tiki-inspired ceramics. He is an instructor at Bristol Community College and Rhode Island School of Design, Continuing Ed. 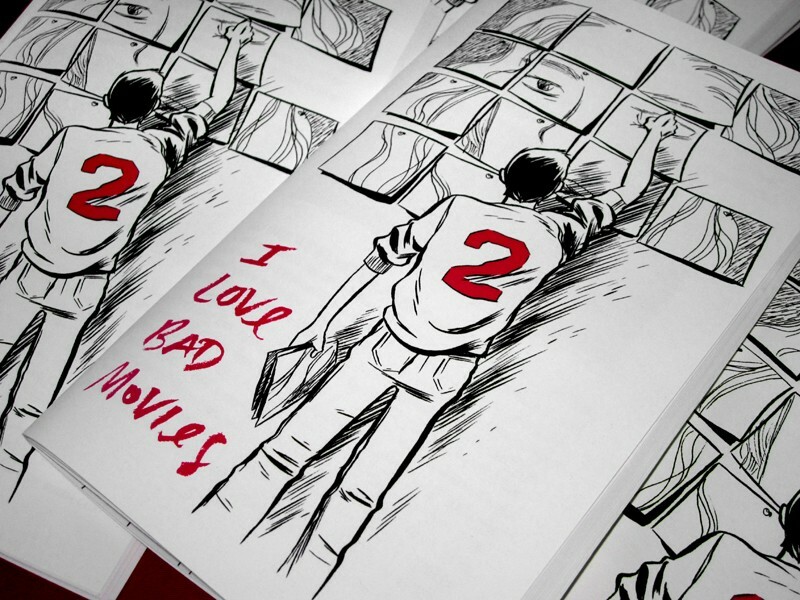 mini-comic Sainted and creates drawings inspired by music and other obsessions. Bob Satuloff is the lyricist of stage musical Elmer Gantry, former Film Editor of New York Native, and former “Gaylienation” columnist for Christopher Street. He hosts Bob’s Walk-in Drive-in, a free neighborhood film series in Carroll Gardens, Brooklyn. Underemployed Adventures of Dallas Heck is on YouTube. spoof films including Hobgoblins (featured on Mystery Science Theater 3000) and the Vice Academy series, which aired for nine consecutive years on the USA Network. Brooklyn from the west coast, possibly to escape the hordes of dive-bombing birds. Jay Stern is a film and theater director, member of the Lincoln Center Directors Lab, and co-founder/producer/host of The Iron Mule Short Comedy Festival. His latest feature, The Adventures of Paul and Marian, was recently completed in New York. 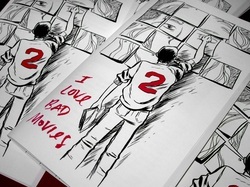 Matt Sullivan is a writer and co-creator of the comic book Comeback Kings, in which Bruce Lee, Tupac, and Elvis have faked their own deaths and formed a crimefighting team. His writing has appeared in Salon, McSweeney’s, and The Onion. Stuart Wellington (Hannibal comic) is a comedian and performer based in Brooklyn. He is a co-host of bad-movie podcast The Flop House and has performed live at variety shows in New York including Kevin Geeks Out, Bad Movie Night, and Flop Night. Sean Welsh is a freelance film journalist in Glasgow, editor of film zine Physical Impossibility, and official blogger for the Glasgow Film Festival. As a programmer for Matchbox Cineclub, he hosts pop-up cinema events throughout Scotland. television series of the same name, which aired for five seasons on IFC. Elliott Kalan is the Emmy-winning head writer for The Daily Show with Jon Stewart; one third of the bad movie podcast The Flop House; and host of Closely Watched Films, a series of actually good movies. Harry Merritt is a cinenaut with NYC-based film screening collective Cinebeasts and has written for an odd assortment of blogs and academic journals in his time; most recently he was published in Nationalities Papers. Eric Nelson is an author of fiction, zine librarian at ABC No Rio, performance artist, and member of the Bushwick-based writers collective 1441. He is also the co-curator of the Fireside Follies reading series. Sabra Embury is the editor of Troika Moonshine 300, a flash fiction journal. Her poetry and fiction have appeared in Nanofiction, Maintenant, and My Name is Mud. Sabra lives in Los Angeles. Alan Gamboa and Sophie Donkin are husband and wife and live in Bushwick, Brooklyn. Watching bad movies together is a cornerstone of their relationship. Dan Israeli is a Queens native and contributor to the sports blog Bleacher Report. He is a reporter for a legal publication and a freelance music writer. Ned Vizzini was a writer of young adult fiction based in New York and Los Angeles. His quasi-autobiographical novel It’s Kind of a Funny Story was adapted into a motion picture by Focus Features. He is missed by all who knew and enjoyed him and his work.